Dum - large claudrons filled with rice, meat, vegetables and spices then sealed and cooked to produce an unbelivably delicious one-dish meal to feed large groups of workers - was once a common dish until the 18th century Nawabs took a fancy to it. 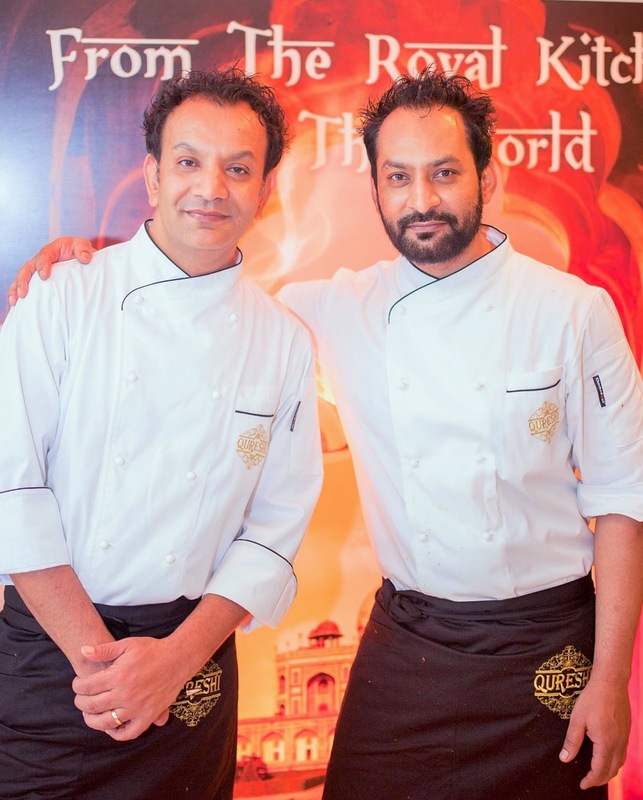 Fast forward to 200 years later, two brothers Mohammed Ashfaque and Mohammed Irfan Qureshi who are from the Nawabs' family of chefs rediscovered the secret of dum cuisine and refined it to majestic new heights. 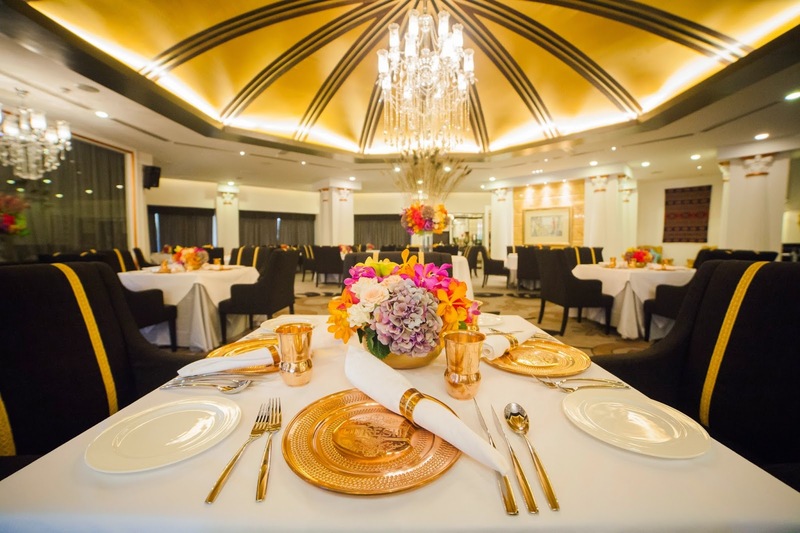 The latest addition to the Qureshi restaurant empire is ensconced within the Kuala Lumpur Golf & Country Club (KLGCC). Opened during Ramadan this year, director Muhammad Ahsan Ali Qureshi shares how his father have carved a hallowed reputation for himself as a chef over four decades, and his four other brothers are emulating the family scion. "I'm the only one out of the kitchen and in the frontline," says Ahsan with a smile. As we sampled the restaurant's house drinks: Thandai (RM15) - a refreshing blend of milk with cardomom, almonds and saffron; Ambi Panna (RM15) - a summer cooler of raw mango, cumin and mint; Nimboo Nariyal (RM15) - coconut lemonade with tender coconut and mint and Lassi (RM15) - mango with yoghurt, Ahsan delves into the secrets of Qureshi's success. "What makes us different is our meticulous and elaborate cooking methods, using handpicked spice mixtures and royal recipes of Mughal empresses. Our battalion of chefs are specialists of different dishes: kebabs, tandoor specialities, briyanis and dums while consistency is ensured from the standard spice blends the brothers have formulated and are produced in the family's own spice factories in India. Having established our footing in India and the Middle East, we're planning to expand further to Singapore, Indonesia and Australia with KL serving as this region's main outpost." Seated in the private dining room, we got a good view that encompasses the opulently furnished dining area that can seat up to 85 persons. Even at its busiest period, the noise is noticeably muted by the plush carpeting, curtain drapery and linen-clad tables. The 'star' dish (for me at least) has to be Tandoori Chicken (RM35) - a whole spring chicken marinated in aromatic tandoori spices and grilled to perfection. The marinade's deep-seated accents have permeated the moist, juicy meat so thoroughly that the juicy meat tasted sublime. After hearing Ashan waxing lyrical about the dum speciality of Raan E Qureshi (RM100), our curiosity was satisfied when the leg of mutton arrived. Once the sealed dough wrapping encasing the mutton was removed, we caught wonderful whiffs of the meat. Unsurprisingly, the meaty chunks were fall-of-the-bone tender, having been marinated in malt vinegar for 24 hours. Stuffed with onion, cheese and mint then cooked dum-style for 2-3 hours, it was served with roasted mushroom. Good enough to be eaten on its own, the pot of Dum Lucknowi Biryani (RM45) also came sealed under a layer of dough. Again, when the covering was removed, a most appetising aroma rose from the mound of fluffy basmati rice perfumed with saffron, spices and marinated lamb; enticing us to dig in with gusto. Simmered in rich, bright vermillion tomato cream flavoured with fenugreek, the sumptuous Butter Chicken (RM35) tasted lush on the palate; the thick, unctuous gravy enveloping our palate with a multitude of sweet, savoury and spicy nuances. We mopped up the irresistible sauce with crisp yet flaky Lache Paratha (RM12) - swirly, thin mint-flecked paratha. The delicious flat breads also paired splendidly with the signature Dal Bukhara/Qureshi (RM30) - mildly hot stewed black lentils with tomatoes and aromatic spices, finished with butter and cream. You can douse the heat somewhat with Raita (RM10) - the restaurant's classic side dish of homemade yoghurt with cucumber (diners also have a choice of boondi, pineapple, tomato, mint or potato). Dessert is taken equally seriously here but they are worth returning for. Try the Classic Rasmalai (RM20) - cottage cheese dumplings in saffron and pistachio reduced milk which boasted a slightly crumbly texture at first bite but soon yielded to dulcet smoothness in a twinkling. Our initial skepticism was banished upon a bite of the Warm Carrot Halwa (RM15). Made from coarsely grated carrot cooked in milk instead of sugar, it is complemented by some super creamy, mildly sweet pistachio kulfi. Spongy without the usual cloying sweetness is Gulab Jamun (RM20). Presented in a cocktail glass filled with diced fresh fruits, it's the perfect treat to conclude your outing to Qureshi on a sugary high. QURESHI - Ground Floor, East Wing, Kuala Lumpur Golf & Country Club, no.10, Jalan 1/70D, Off Jalan Bukit Kiara, KL. Tel: 03-2011 1007. Opening hours; Daily except Mondays from 1130am-230pm; 630pm-1030pm. Like the heady drug it's named after, Opium is the latest venture under Werner Kuhn's F&B group that has taken the KL scene by storm. The al fresco patio crowded with mainly corporate types look innocent enough until you step into its retro-inspired, Chinois-accentuated confines that mimic a dimly lit, bodacious den with a warren of semi-hidden pavilions, private rooms and cosy nooks. Whether it's food, fun or frolics, Opium is conceived to feed those addictions with a large dose of chutzpah thrown in. Lifting our spirits up from the get-go is Peking Man (RM32), an imaginative concoction of vodka with Pu Er tea, longans, lime juice, egg white and orange bitters. Slightly foamy at first sip, the alcoholic punch soon kicks in after the quirky sweet, sour and faintly bitter accents. Best not to chug everything at once unless you're looking to make happy hours far happier than usual. From the Twisted Classics repertoire comes Concubine's Batida (RM28), another potent blend of cachaca (a distilled spirit made from sugarcane juice), lime juice, fresh pineapple and sugar. We love the inventive presentation too; a far cry from the ho-hum cocktail glasses and normal dish of peanuts. As and when hunger pangs strike, fear not. Depending on your mood or appetite, the ambitious menu is expansive enough to cover all bases; from all day & night snacks and tummy warmers to noodles and mains. Our selection of Lamb Patties (RM18), Ikan Bilis Fritters (RM12) and Salt & Chilli Squid (RM15) turn out good in some parts, not so in others. Lightly smothered in melted cheese, the savoury and faintly gamey lamb patties are the most agreeable. Slightly floury in texture with the wrong type of anchovies used, the fried anchovy fritters fall short of expectations. The squid at least is nicely springy despite being unevenly salted. The marketing team duly noted our feedback and promised remedial action. Two gems that hit the spot are the Lemongrass Sticks (RM12) and Chicken&Beef Satay (RM18, 1/2 dozen). Sheathed in a skein of fu chuk (beancurd skin) and enrobed around lemongrass stalks, the skewers of deep-fried minced chicken and squid are incredibly addictive especially when dipped into the house robust chilli sauce. The deep-seated marinade helps to score some extra points for the satay too. You may blanch at forking out a handsome sum for the Opium Wantan Noodles (RM28) but it's a 'pimped up' version that won't be found at any hawker, kopitiam or resto in town. Buried under a pile of crispy deep-fried spinach and oyster mushroom, the toothsome, ultra-fine noodles lightly tossed in soya sauce and some sauteed minced chicken is a surprisingly 'star' dish that draws rave reviews. Coming in a close second is Crispy Duck Noodles (RM28), an ambrosial offering comprising crunchy deep-fried noodles in viscous egg sauce with chopped duck meat and spring onion. Several slices of smoked duck breast lend the naughty noodles additional pizzazz. The Curry Spaghettini (RM28) is scrumptious too save for the undercooked brinjal. Otherwise, the piquant spiciness and creamy coconut-rich gravy make this highly recommended. Another dish that rocks is Fern Leaf Salad with Grilled Prawns (RM24); a tempting local salad which has wild local fern tips (pucuk paku) dressed in a tantalising sambal sauce scented and flavoured with ginger flower, coconut, shallot and lime juice. With succulent grilled prawns ramping up its appeal, this is a surefire winner in our book. Equally notable are Grilled Chicken Wings (RM15), a favourite snack with drinkers but the ones here really soar high after being spiked with chilli, lemongrass and assorted spices. They taste similar to Buffalo wings albeit with well-balanced, Asian-centric flavours. If you enjoy souping up, you'd lap up the Peppery Lamb Soup (RM18). Simple and comforting, the spice-scented broth has cubed lamb, carrot and potato with a sprinkling of coriander and fried shallot to boot. More adventurous diners may wish to foray into the IndoChinese realm through the Stewed Chin Baung Chicken (RM35); braised chicken that credits its appetite-whetting allure to a type of fresh herb known as kenaf leaves from Myanmar. A discernible lush lemony tang prevails, making it distinctly outstanding. Closer to home is Wagyu Rendang (RM38), a delectable serving of robustly spiced, tender Wagyu beef. Turmeric and kaffir lime leaves in the timeless rendang dish evoke a truly festive feeling; it's as if we're celebrating Hari Raya all over again. The spice trail leads further to some scrumptiously Creamy Butter Prawns (RM42). Instead of dry and gritty flecked or wispy egg battered crustaceans, the prawns are enrobed in a wickedly rich coating of milk, butter, chilli, garlic and curry leaves. They hit all the right notes and are best enjoyed with some poppy seed rice or lotus leaf buns. The good vibes continue with a nod to Cod in Curry Sauce (RM38). You'd think the fish would be too oily for such creamy treatment but the chef has gone light and easy on both spice and coconut cream quotients so the inherent fish sweetness is aptly safeguarded. Definitely a winner this. Meat lovers would find ample satisfaction in the hearty options of Beef Brisket & Tendon Stew (RM35) and Braised 5-Spice Duck (RM35). The former is another classic comforting crowd-pleaser with melt-in-the-mouth tender brisket and tendon stewed in soya and oyster sauces, star anise, cinnamon and king oyster mushroom. Some dried chillies are included to inject the combo with bursts of zesty heat. Duck fans would go quackers over the latter; super-tender breast meat redolent with the muted sweetness of five spice, white radish and cranberry jus. The gravy is really the high point when it's drizzled over the poppy seed-studded rice. The Sweet Stuff showcases Cheesy Banana Fritters (RM18) which will have you going bananas over them. Flecked with grated aged cheddar and banana ice cream, it's a sublime combo of hot and cold, sweet and salty on a plate...yums! You can also chill out with (pix below, left-right): Opium Ice Glass Special (RM18), Sago Gula Melaka (RM15) and Melon Ice (RM15) for more sugary high. Opium's version of ais batu campur (ABC) in a glass consists of shaved ice, grass jelly, waterchestnuts, basil seeds, peanuts, corn, mung bean paste, coconut milk, melted gula melaka (palm sugar syrup) and coconut ice cream. A superb blend of textural contrasts and delightful sweetness that brooks no competition or dietary willpower. Strips of jackfruit add a nice dimension to the perennial trinity of sago pearls, coconut milk and gula melaka while more sago pearls and coconut milk upped the interest factor in the Melon Ice. Trust me, everyone is bound to raise a glass or two or three anytime to these irresistible dessert. To know Malaysia is to dine in Malaysia...in line with Visit Malaysia Year 2014, this is your chance to romance the halcyon days of Straits Chinese cuisine through Chatz Brasserie's Best of Malaysia: Nyonya Cuisine by Chef Debbie Teoh promotion. 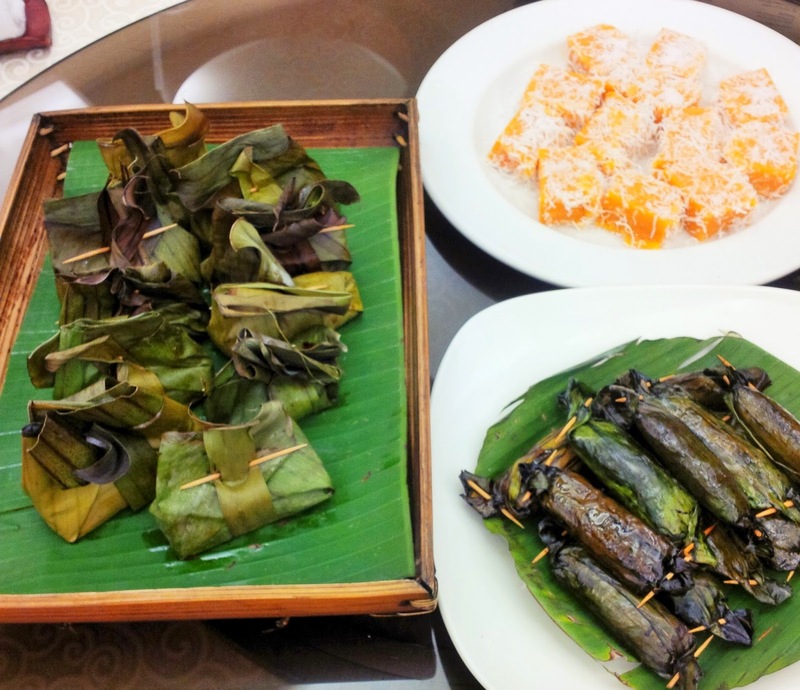 We were lucky to get a sneak preview of what Malaysia's Queen of Nyonya cuisine will be serving up at ParkRoyal KL. Featuring almost extinct recipes such as Kuih Bongkong and Pais Buah Keluak, diners can be sure they'd be in for some authentic treats for the promo which takes place every Friday & Saturday night for dinner and weekend high tea from now until 12 October. Debbie herself would be holed up in the hotel to personally prepare the various dishes; a mean feat in itself as Nyonya specialities are notoriously time-consuming and labour-intensive to prepare and cook. True to her Straits Chinese background, the lady has even unearthed some long-lost and almost extinct recipes to showcase for this promotion. I had a dose of nostalgia when I tasted her soul-warming Hu Pio Soup (pix above of fish stomach soup). Light and clear on the palate, the textural interest came from spongy pieces of deep-fried fish stomach and the unexpected inclusion of two fresh prawn dumplings. Flecks of deep-fried garlic added a sublime deep-bodied flavour which saw us slurping everything up to the last drop. Debbie's next labour of love was Nasi Ulam - a rice salad of sorts that's heavy on turmeric and assorted local herbs: finely cut shallot, turmeric leaves, bird's eye chilli and lemongrass among others. A really painstaking dish to prep as I have attempted to make it in the past. One rare dish we sampled was Pais Buah Keluak (RM30 for 2 pcs; served a la carte). 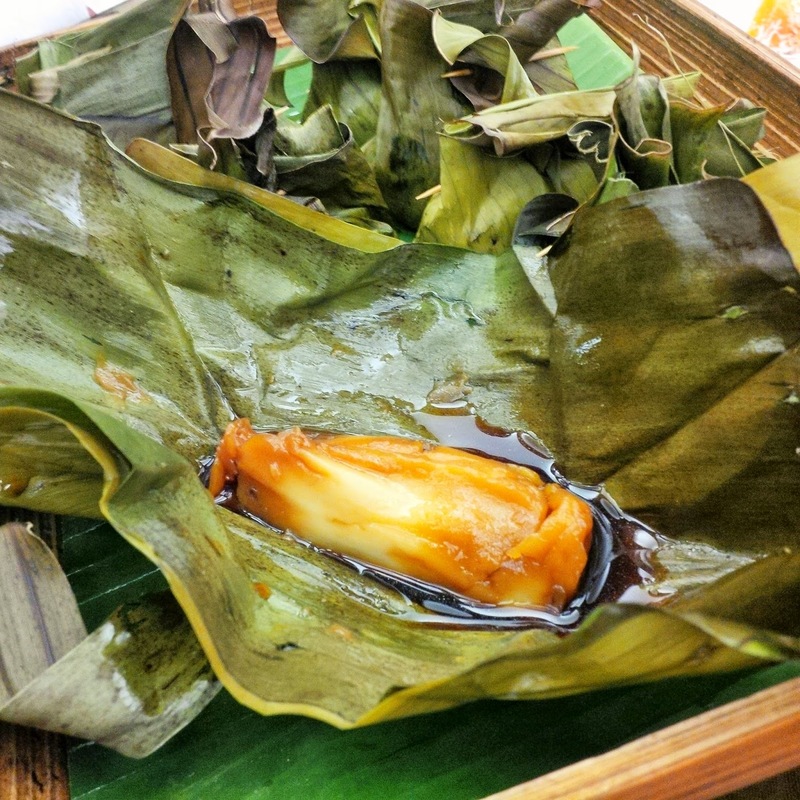 This steamed fish meat in banana leaf parcel is similar to its spicier counterpart known as Otak-otak but instead of ground spices, the fish is mixed with that mysterious black nut from Indonesia, giving the ensemble a faint ashy-bitter chocolate nuances. Some diners may find this speciality an acquired taste but it's recommended you should sample it at least once. Dark and mysterious with vein-like streaks, this tough nut (pix above) is really a seed from or the Kepayang (Pangium edule), a mangrove swamp tree. According to Wikipedia, the raw seeds are as poisonous as cyanide. They have to be boiled and buried in ash, banana leaves and earth for forty days; turning the creamy white nuts to dark brown or black. The hard and bitter kernel inside is an essential ingredient in the preparation of Ayam Buah Keluak, another typical Nyonya dish. Those of us who enjoyed buah keluak couldn't resist digging in and scooping up the dark, creamy paste within. The richly spicy chicken was tender and thoroughly suffused with its unique nuance which Debbie dubbed as Peranakan truffles. Penang Perut Ikan (pix above) is yet another almost extinct delight that you'd be hard pressed to find in today's Nyonya restaurants. Debbie's sterling version had that vivid melding of savoury, sweet, sour, and spicy accents that completely erased the disappointing versions I have had in the past. One can eat loads of rice accompanied by this dish alone; in order to appreciate the melange of finely shredded herbs, vegetables and pickled fish stomach fully. 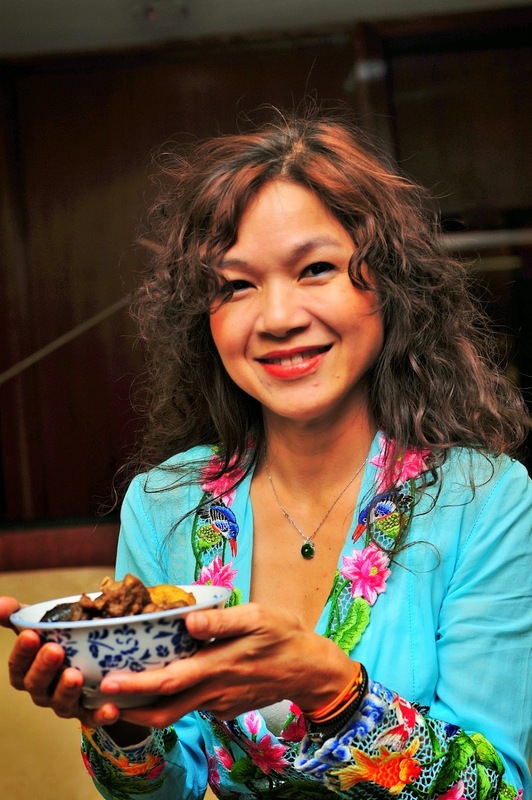 From her maternal Melakan side, Debbie proffered a rich, thick Ayam Pongteh, chicken stewed with taucheo (salty fermented soy beans) and gula melaka (dark palm sugar). Again it is a comforting offering that goes best with plain white rice. 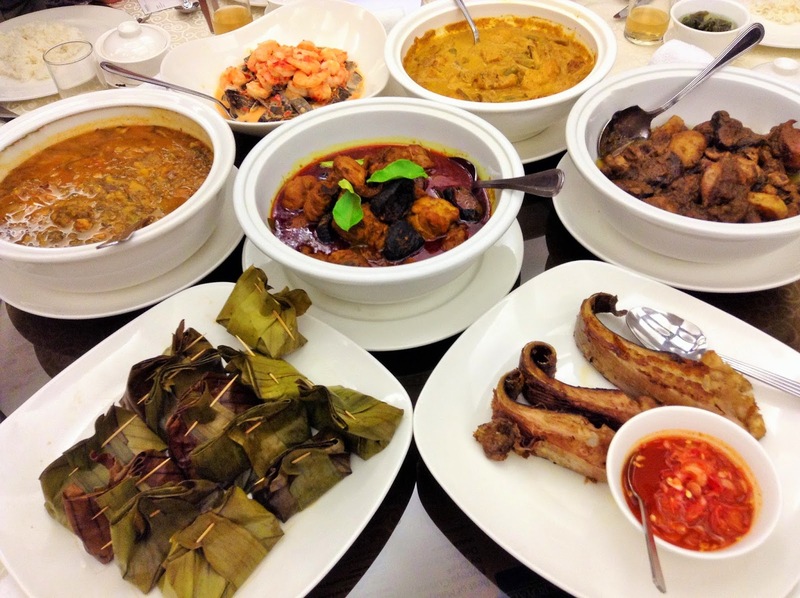 A Nyonya feast cannot be relished without rice; not when there are irresistible, appetite-whetting servings of Gulai Kiam Hu Kut or Curried Salted Fish Bones. Unabashedly creamy with a muted brininess, the splendid curry drew rave reviews all around as we drenched our rice with the piquant gravy. Complementing the heartier dishes is Kerabu Jantung Pisang with Prawns - a scrumptious creation that warms the cockles of our hearts with the use of the humble banana flower 'heart' (the equivalent of the Asian artichoke). Up until now, we have always encountered it in kerabu (local salad that consists of the finely chopped heart of the banana flower and tossed with chilli, toasted grated coconut and shallot). Needless to say, it was another huge hit as the zesty chilli and spice notes set our tastebuds tingling with pleasure. Even the usual grilled fish was given a fresh twist. The celeb chef served the grilled fleshy stingray with an almost forgotten sauce concocted from kalamansi lime juice, pounded chilli and sliced onion, calling it Fish Panggang with Lum Chut Sauce. For high tea, expect delectable nibbles and kuihs galore. 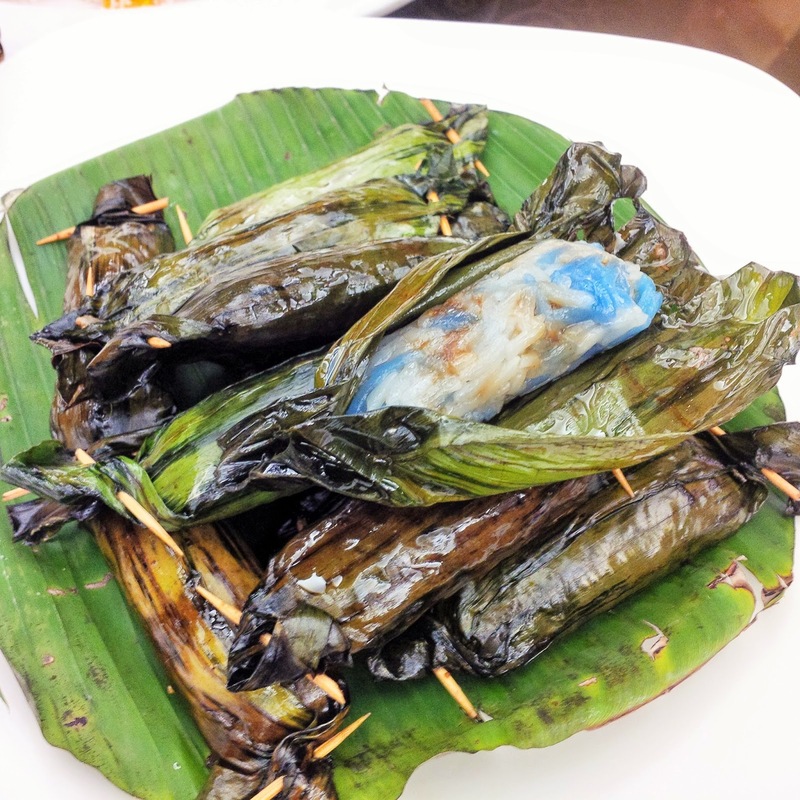 Top pick includes the delicious Rempah Udang, an old-school treat comprising grilled tubular parcels of glutinous rice with a subtly spicy filling of pounded dried shrimp with grated coconut. The rice is stained a pretty blue using the juice of pea flowers. Kuih Bongkong and Sweet Potato Kasui are superb throwbacks to the era where familial matriarchs reigned supreme and would outdo each other with colourful and tempting array of kuih-muihs; sweet cakes made mostly from glutinous or rice flour, palm sugar, grated coconut or coconut milk and literally anything and everything that's locally grown and freshly available in abundance.Most are usually steamed although there are also selected grilled or fried kuihs. Again Debbie has stayed true to her roots in making these traditional treats, with the only concession being the amount of sugar used is much less now. The two dessert we savoured were to-die-for with no seconds in sight. To complement the meal, we were served two healthy refreshing drinks: Serai (lemongrass) and Kedondong (a tropical sour, fibrous plum-like fruit known as Spondalis dulcis). The Best of Malaysia: Nyonya Cuisine by Chef Debbie Teoh is available for Friday & Saturday dinner buffet at RM125 nett per person and Sat & Sun high tea buffet at RM78 nett per person. Cooking enthusiasts can pick up tips and tricks on Nyonya cooking from the celebrity chef herself during High Tea on Sun (prior seat reservation required). For reservations, call Chatz Brasserie, tel: 03 - 2147 0088.